1. Are you handy with tools? Yap.. My college course and first job in semi-conductor electronics company made me one. 2. What was the best thing that happened to you this week? First-ever vacation of hubby from work for good. He resigned and will study. 3. What was the worst thing that happened to you this week? I nearly collapsed from over fatigue, I guess I had too many online writing works but I'm happy with my work because it's a blessing from God. I just need to manage my time more so my health won't suffer. 4. Do you think you act your age? More often than not I think :-) sometimes we need to be young at heart to enjoy the sweet simple things of life. 5. Describe an item of clothing that has definitely seen better days but that you refuse to dispose of and still wear. Why won't you toss it? My cardigans/sweater I have since I was single around 14 years ago. It's a gift from a friend and has sentimental value. I don't toss gifts, I keep it forever! 6. What is your favorite summertime beverage? Real fruit shakes especially green mango, melon and banana fruit shakes. 8. What was the most memorable birthday party you've attended? My Mom's birthday party at the resort, not so much activities and no program but all my loved ones were there and we enjoyed it very much ....it's a swimming party celebration. The best for us. Accidents in the mountain highway. We had one when I'm just 9 years old and our bus nearly dropped down the mountain cliff. God has saved us from that accident and it thought me to pray hard for guidance on every travel that I take. This is my pick for the theme this week. I've chosen this picture of our Princess Kriselle (daughter of my niece and goddaughter) who recently celebrated her first year birthday. 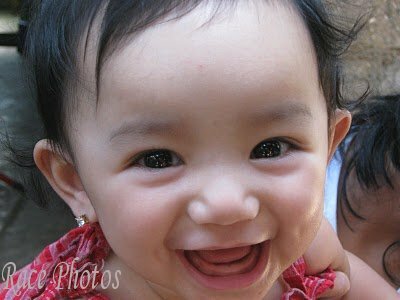 She was only 7 months old here and wearing her prettiest smile with eyes that sparkles. I love this photo of Princess because she was very happy here. Well up to now she always smile like this and always showing off her cute dimples. She's as pretty as her Mom who happens to be my flower girl when I got married. For more photo hunt 'Sparkle' entries just click on the badge above. When we celebrate Mom’s birthday on the resort by the lake two of my kids who spent swimming since morning got sore feet. I learned that they walked barefooted on the hot pebble tiles even if I told them to wear their slippers every time they go out of the pool. I’m just glad that it’s only sore feet and not that painful as eczema which I’m dreading to happen to any of my kids because I’ve seen how a relative of ours suffered from the disease for more than 2 years. Well lessons learned for Josh and Ruth as I told them if they had followed my advice they would not hurt their feet. It's just lucky that I bought my favorite ointment for skin. I asked them if they will still go with us and swim when we come back to the resort and they immediately answered yes. Kids are really funny, they easily forgets the pain just like air passing through our skin. DH just can’t stop working in the house. He‘s on vacation but he’s spending most of his time sorting things up just like his warehouse in his job. He’s been doing it for three days so you can just imagine how busy and energetic he is. If all people are like him no one will need to read alli reviews because every one will be fit and slim. I keep telling him that his muscles must have come from arranging appliances in the warehouse. Good for him as he didn’t have to go to gym to have his workout because if you will see him he’s as fit as an athlete, makes him younger than his age. I envy him of course because when we got married we’re just the same but now I’ve gained weight. Anyway no matter how I gain weight he’s still as loving as ever.